Turns out the high-tech electric I.D. Roomz isn’t the only new SUV Volkswagen is showcasing at the Shanghai Auto Show this week, as the German automaker has unveiled a super-sized concept called the SMV. 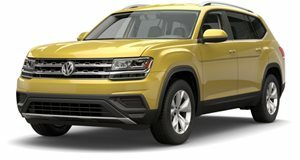 Quite simply, it’s by far the largest SUV Volkswagen has ever built. At 201 inches long and a wheelbase close to 10 feet, it’s even bigger than the Atlas, which is sold as the Teramont in China. While the SMV is only a concept for now, VW intends to put it into production in China within the next two years thanks to its local joint venture with FAW. Like most modern VW models, the SMV concept is based on the automaker’s flexible MQB modular architecture and shares powertrains with the Teramont. When it goes on sale in China, buyers will have a choice of either an entry-level 2.0-liter TSI engine or a larger turbocharged 2.5-liter VR6 in the more expensive variants. Mated to a seven-speed DSG transmission and 4Motion AWD, the six-cylinder engine makes produces 295 hp and 368 lb-ft of torque. Little else is known about the SMV as Volkswagen hasn’t released many details about the new concept, or even any interior shots. Judging from the dimensions, it will be a flagship SUV with a spacious interior offering room for up to seven occupants. We like the look of it, too. Despite its massive proportions, the SMV looks sporty thanks to its curved hood and muscular wheel arches. It looks production ready compared to other concepts, but don’t expect it to go on sale in the US as the production version will only be available in the Chinese market.